Lee un artículo de nutrición. Contesta preguntas sobre el artículo. Describe que comiste ayer en nuestro blog. Adults should eat 2 1/2 cups of vegetables and 2 cups of fruits total every day. According to the USDA, we should eat more red, orange, and dark green vegetables like tomatoes, carrots, and broccoli. We should eat 6 ounces of grains every day. One ounce is one slice of bread or 1/2 cup of rice, cereal, or pasta. At least half of your grains should be whole. We should eat 3 cups of dairy products every day. These can be milk, yogurt, cheese, or any other dairy product. Choose low-fat or non-fat dairy products when possible. We should eat 5 1/2 ounces of protein every day. Protein sources include meat, seafood, beans, nuts, and eggs. Try to eat fish or seafood at least twice a week. Include these five categories of foods in the recommended amounts in your meals and you'll soon be much healthier. 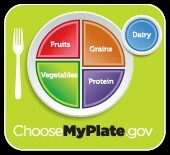 *The ChooseMyPlate educational program and image were created by the U. S. Department of Agriculture (http://www.choosemyplate.gov/). Contesta las preguntas con "True" (Verdad) o "False" (Falso). 1. According to the USDA, we should eat more vegetables than fruits. 2. We should eat more red, orange, and dark green vegetables. 3. We should eat 2 cups of dairy products every day. 4. Broccoli, an apple, rice, fish, and a glass of milk would be a healthy meal according to the USDA recommendations. 5. We should eat fish at least five days a week. Describe que comiste ayer (desayuno, almuerzo, cena, y bocados).